The 2016 Honda Pilot is the best choice for families because it fact, the more kids you have, the more you will appreciate Honda's largest, and only three-row SUV. It is still versatile, roomy and incredibly safe, but this year's Honda Pilot has a new sleeker look that sets it apart from the rest. Both the hood and roof are more contoured for 2016, and the available LED headlamps, tail lights and daytime running lights take the new streamlined design to new heights. It does not look like the old Pilot, or anything else. You must experience the new Pilot in person to see how both the interior and exterior have been upgraded. A great place to see the new Pilot is Venice Honda located at 985 US HWY 41 in Venice, FL. We've been selling and servicing Honda vehicles for many years, and we've noticed a Honda Pilot phenomenon. Usually, when a couple or a family comes to Venice Honda to purchase a new vehicle, one of them is overjoyed at the prospect and the other is, well, happy for their spouse's joy. But with the Honda Pilot, everyone is beaming with the joy - the spouse, the kids, even the pets! The 2016 Pilot was clearly designed for people who have a lot of schlepping in mind. The all-wheel-drive model can tow a whopping 5,000 pounds, and even the front-wheel-drive models can pull 3,500 pounds. In short, it's the perfect family-hauler for 2016. We invite you to Venice Honda for an exciting test-drive of the 2016 Honda pilot. Our service area includes our friends and neighbors in Sarasota, Bradenton, Venice, North Port, and Port Charlotte, so everyone is welcome to take a first-hand look at the big and bold new Pilot. Bring the whole family, and a selfie stick! The inside of the luxurious 2016 Honda Pilot is truly cavernous. Wait, is that an echo you hear? It can seat eight adults comfortably, and still have enough room for an 82-quart cooler behind the third row - talk about room to spare! With the second- and third-row seats folded down, the new Pilot gives you a jaw-dropping 109.2 cubic feet of cargo space, enough to transport a medium-size elephant. The interior is noticeably plusher with soft-touch materials and bolstered seats, but the kicker is the available second-row cozy captain's chairs which your passengers will fight over. Fortunately, the amazing rear entertainment system with DVD or Blu-ray™ disc player will quiet everyone down with a vivid 9-inch screen. For the driver's convenience, the 2016 Pilot includes an ingenious audio touch-screen that allows you to touch and swipe your way through all the audio controls. You never have to take your eyes, or your mind, off the road. Even in reverse, the new Pilot is forward-thinking, with a multi-angle rearview camera that gives you three different views: normal, top-down and (fisheye) wide. It will make you a better driver in reverse than you are going forward. 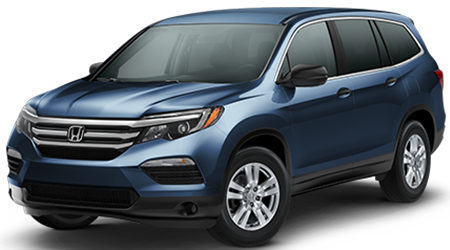 You owe it to your family to come experience the 2016 Pilot at Venice Honda, FL, where we have just received a large inventory of new Pilots in all trim levels, including the LX, EX and EX-L, and a limited number of breathtaking Elite and Touring models that feature nine-speed automatic transmissions. We cater to discerning drivers from Sarasota, Bradenton, Venice, North Port, and Port Charlotte, so drop by soon. Our service is unbeatable and our prices are sweet. One visit to our spacious showroom at 985 US HWY 41 in Venice, FL, will win you over for life. Come see the majestic and versatile 2016 Honda Pilot at our facility soon!